We’d love your help. Let us know what’s wrong with this preview of A Green Place to Be by Ashley Benham Yazdani. How did Central Park become a vibrant gem in the heart of New York City? Follow the visionaries behind the plan as it springs to green life. In 1858, New York City was growing so fast that new roads and tall buildings threatened to swallow up the remaining open space. The people needed a green place to be -- a park with ponds to row on and paths for wandering through trees How did Central Park become a vibrant gem in the heart of New York City? Follow the visionaries behind the plan as it springs to green life. To ask other readers questions about A Green Place to Be, please sign up. Nancy This looks wonderful. Always looking for meaningful children’s lit. This is a book likely to be of the greatest interest to families with a connection to New York. I grew up around 90 miles north of Manhattan, and I was fascinated by the city as a kid, but my Maryland-born daughters don't yet have the context for being interested in the details of New York City history, so I haven't shared the book with them. For New Yorkers, though, this will be a welcome addition to libraries and classrooms. I noted that the illustrations - particularly those of the present da This is a book likely to be of the greatest interest to families with a connection to New York. I grew up around 90 miles north of Manhattan, and I was fascinated by the city as a kid, but my Maryland-born daughters don't yet have the context for being interested in the details of New York City history, so I haven't shared the book with them. For New Yorkers, though, this will be a welcome addition to libraries and classrooms. An entertaining and informative book about the creators/creation of Central Park. I didn't know anything about the history of Central Park prior to reading this and it educated me quite a lot! We learn about how Frederick Law Olmsted a Calvert Vaux came up with the idea for the park and how they did it. I learned that the men were both environmentalists and wanted a taste of nature's serenity and beauty in the middle of a bustling city. They took a muddy mess and made it into an international lan An entertaining and informative book about the creators/creation of Central Park. I didn't know anything about the history of Central Park prior to reading this and it educated me quite a lot! They took a muddy mess and made it into an international landmark. I loved the details about the seedlings they planted that are the massive trees shadowing the park today, and how the arches and bridges were works of art in themselves and just as important as anything else to the parks' atmosphere. A well crafted and wonderfully illustrated telling of how Central Park was created and established. Loved it! Beautiful illustrations. A great read for 7-10 yr olds. I love that the extra information in the back of the book also had illustrations and fascinating descriptions of the changes. I really enjoyed getting explanations of what the architects were thinking from the tree choices to the squirrel population. Great inspiration as well about seeing enough of the future to create lasting beauty for all to enjoy. Taking a rather extraordinary historical moment and creating a picture book to help children visually see how the Central Park was created is quite the project to take on. This book definitely lays out the creative construction of the park, including many historical milestones such as the lake creation for winter skating and summer boating/trail enjoyment. The era is the 1800s when all this occurred. The artwork that accompanies the story is interesting and detailed. The medium used was pencil and then watercolors. The author is also the illustrator and her work is very colorful, the people are drawn clothed and behaving as those who lived in the 1800s. She did a good job of this. The writing is geared toward an older demographic of kids, perhaps first readers to maybe chapter book readers, so ages six to perhaps, nine. I can also see a teacher reading this to younger students in class and showing them the pictures, or, a parent assisting with reading at home. Definitely an adult would be involved because of some of the words used. Overall, this book is both entertaining and educational. The artwork is engaging, informative and colorful enough to hold a child’s attention. There’s a lot to see and I can see a child sitting with the book in their lap absorbing every detail. Even without the writing, the illustrations do tell a story on their own. I loved this fascinating story of the creation of Central Park by two really brilliant far-sighted people, Frederick Law Olmsted and Calvert Vaux! Yazdani does an outstanding job with this debut picture book. Her informational text is clearly presented and and wonderfully suited to young readers, both those that are familiar with the park and those who aren't. Excellent back matter includes additional information about the Olmsted and Vaux, fascinating tidbits about the architecture, bridges and I loved this fascinating story of the creation of Central Park by two really brilliant far-sighted people, Frederick Law Olmsted and Calvert Vaux! Yazdani does an outstanding job with this debut picture book. Her informational text is clearly presented and and wonderfully suited to young readers, both those that are familiar with the park and those who aren't. Excellent back matter includes additional information about the Olmsted and Vaux, fascinating tidbits about the architecture, bridges and arches, and other details. A bibliography and author's note round out the back matter. Exquisite illustrations in watercolor and pencil are filled with charming details that extend and enhance the story. The illustrations fill the wide pages and reward careful examination. A back matter note encourages readers to find the 22 grey squirrels scattered throughout the book. Whether you are a city, country or in-between-city-and-country dweller, walking into a protected, dedicated natural place for public use is like entering a sanctuary. The hours and days spent in local, state and national parks have a lasting beneficial effect on our minds. The more often we can experience what these spaces have to offer, the more inclined we are to seek them repeatedly. Their worth is immeasurable. More than 160 years ago the first of America's landscaped public parks was formed into existence. 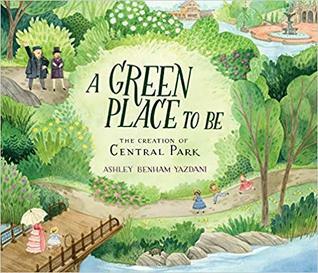 A Green Place To Be: The Creation Of Central Park (Candlewick Press, March 12, 2019) written and illustrated by Ashley Benham Yazdani chronicles a dream and its fulfillment. Today the park covers more than 840 acres. Debut writer-illustrator Ashley Benham Yazdani has done an exquisite job of exploring and explaining the creation of this famous man-made park. Acknowledging the people who inhabited the area prior to the creation of the park, to fascinating back matter, and everything in between, Ms. Yasdani's beautiful, detailed illustrations compliment the thoroughly absorbing text. I delighted in following the squirrel from the crate onward, and looked for it on every page, even before reading about the squi Debut writer-illustrator Ashley Benham Yazdani has done an exquisite job of exploring and explaining the creation of this famous man-made park. Acknowledging the people who inhabited the area prior to the creation of the park, to fascinating back matter, and everything in between, Ms. Yasdani's beautiful, detailed illustrations compliment the thoroughly absorbing text. I delighted in following the squirrel from the crate onward, and looked for it on every page, even before reading about the squirrels in the back matter! It would be fun for readers to look out for some of the bridges that remain, when visiting the park. Did you ever wonder how Central Park in New York City came about? If so, this is a book for young and old alike. 1858, NYC, Calvert Vaux and Frederick Law Olmstead came up with a winning design for Central Park A stunning place with some 34 unique bridges, master gardens everywhere, fountains, pagodas and so much more. This book is detailed and fascinating and, whether you are young or old, I'm sure you will enjoy learning about the park's creation. Stunning illustrations as well. Stunning. Gorgeous. Fascinating. Ashley Benham Yazdani's wonderful book tells the story of how Central Park in NYC came about, and the architects who had the vision for it. The park is a gem, and so is this book. This fascinating story of the development of that area is entertaining an eye opener for the reader. It would be a great addition to a classroom unit on conservation, history, or the importance of green spaces. Very interesting book on how NYC Central Park was created.